We have many long standing Customer relationships in some cases of over 20 years, and we are very proud of these long-term partnerships. Our operators are fully trained to undertake the work entrusted to them. As professionals they have pride in their ability to carry out any job in the most efficient manner. We do, however, require that all cuts and holes be clearly marked out before their arrival and if need be someone on hand to clarify any special requirements, avoiding lost time and possible mistakes. We welcome any suggestions as to possible improvements to our service and value client feedback highly. We regard our reliability as one of the keys to our long-standing success. We understand fully how important it is for those who use our services that we arrive on time and carry out the work to the agreed schedule. 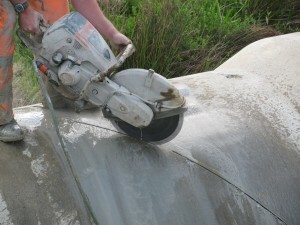 Do you need help or advice with with concrete cutting or drilling? We are always happy to give our clients the benefits of four decades in the business. Getting advice from experts before you start a project often saves time and money! We will always supply a quotation without obligation on any project – where required as an official written quote.